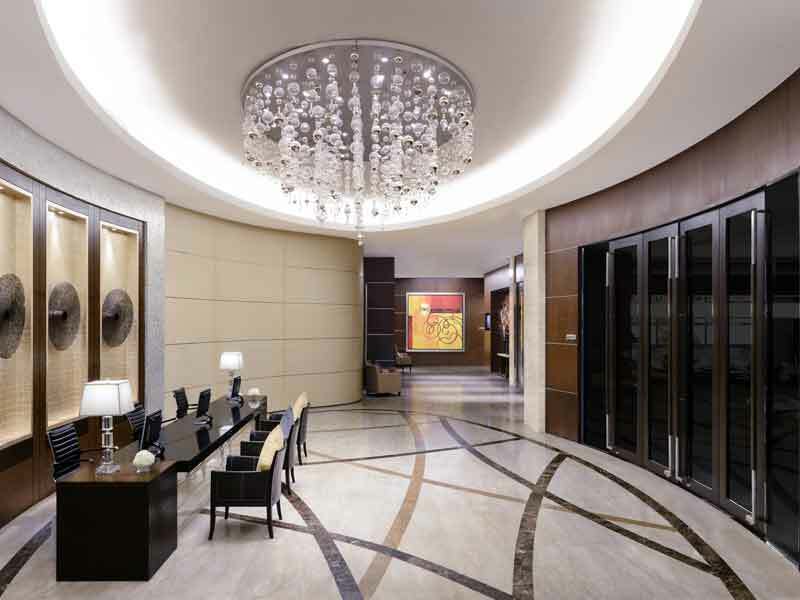 Nestled in the heart of Thailand’s capital, 5-star Sathorn Vista, Bangkok – Marriott Executive Apartments exudes spacious and luxury living. Ideal for business and leisure travellers, this chic property features an outdoor saltwater pool, fitness center and contemporary event facilities and is perfectly situated near the famous Wall Street, unparalleled night markets, exotic dining options and other popular attractions in Bangkok. Whether you’re a shopaholic, adventurous night-owl or seeking an unbeatable culture exchange, Sathorn Vista, Bangkok – Marriott Executive Apartments is the holiday for you. Located in the center of Bangkok, this resort offers grand 1 and 2-bedroom apartment options and a myriad of 5-star services. Dripping in luxury, these rooms boast captivating views of Bangkok’s imposing business district. The apartments also feature high-speed Wi-Fi, marble bathrooms, flat-screen TVs, a fully-equipped kitchen, advanced connectivity devices and a host of other world-class amenities. Around the property, guests have access to an elegant resident lounge and modern event facilities so corporates can mix work and pleasure. Explore Bangkok in style with the on-site limousine and tour services or take time to rejuvenate in the saltwater pool, whirlpool jacuzzi, sauna and wellness center. For more adventure, hit up the games room or stimulate your taste buds at MoMo Café – with exquisite all-day dining (international dishes available for your convenience). Perhaps the highlight of Sathorn Vista, Bangkok – Marriott Executive Apartment is the stylish poolside bar, flaunting superb vistas of Bangkok’s famous skyline. 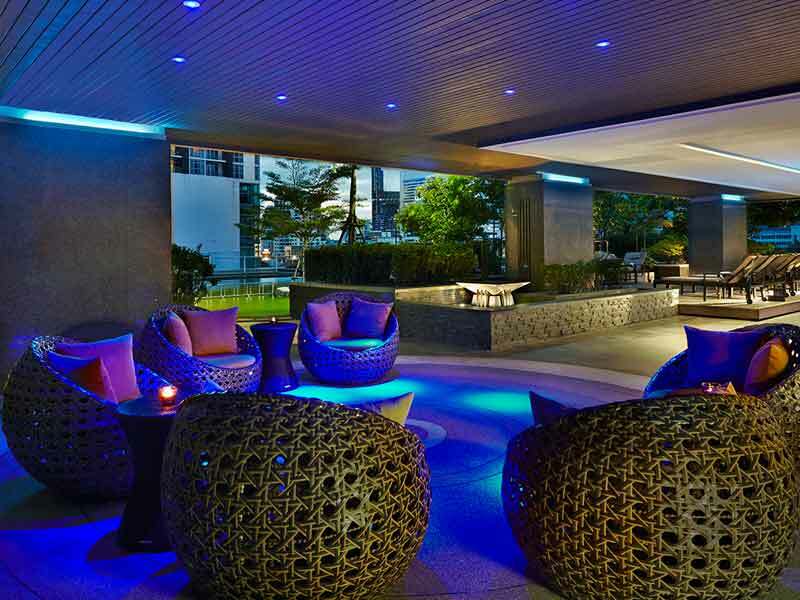 Why Go to Marriott Executive Apartments Sathorn Vista Bangkok? 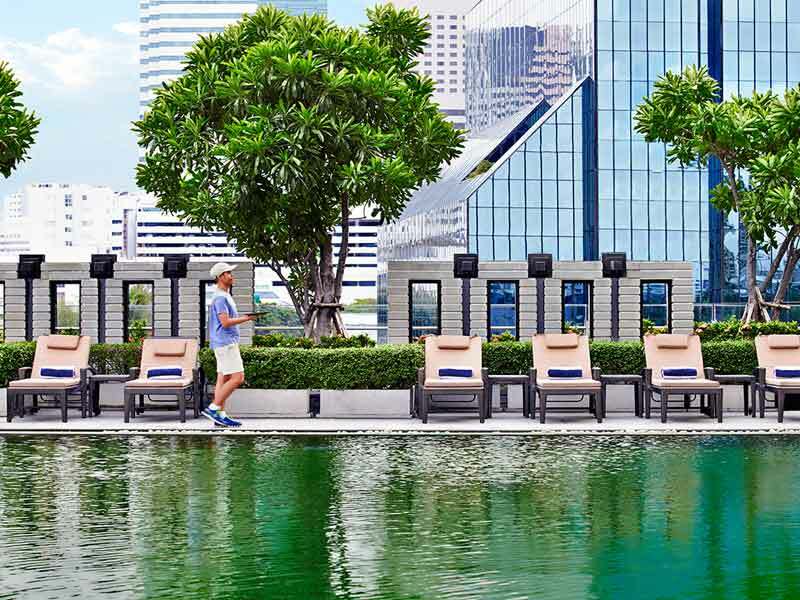 If Sathorn Vista, Bangkok – Marriott Executive Apartments’ skyline pool bar, resident lounge, grand saltwater pool and decadent MoMo Café doesn’t satisfy you, there are endless Thai adventures to be had outside of hotel walls. Bangkok is known for its glitz and glamour as well as its profoundly diverse culture. The vibrant metropolis offers divine Buddhist shrines and temples, markets-galore and the most authentic food scene largely influenced by 15th-century Thailand. If this sounds like your kind of holiday, call our Holiday Experts on 1300 008 424 today. 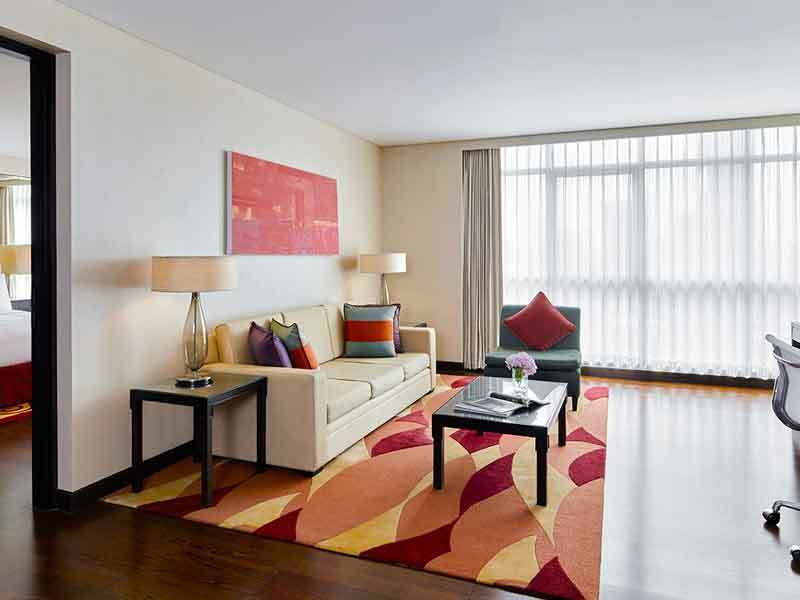 The 1 Bedroom Deluxe Suites at Sathorn Vista, Bangkok – Marriott Executive Apartments convey contemporary luxury. At 65sq. meters, these rooms feature air-conditioning, a living and dining area, fully-equipped kitchen and floor-to-ceiling windows so you’re free to relish views of Bangkok’s dazzling skyline. Feel like royalty in the pillow-top King bedding, marble bathrooms, cosy robes and slippers, in-room dining and hi-tech connectivity devices. At a spacious 75sq. meters, the 1 Bedroom Executive Suite is designed for ultimate comfort. With a separate dining and living area, full-stocked kitchen, floor-to-ceiling windows and marble bathroom, you’ll become acquainted with the luxurious life. Overlooking Bangkok’s vibrant CBD, the suite features King bedding with a deluxe pillowtop mattress, plush robes and slippers, a grand bathtub, room service, tea and coffee making facilities, Wi-Fi and a flat-screen to enhance your stay. 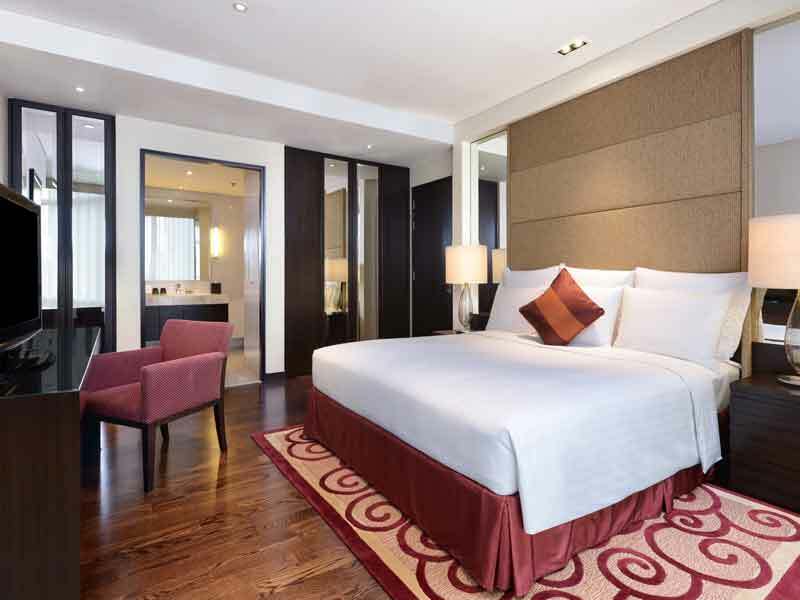 Built for extravagance, Sathorn Vista, Bangkok – Marriott Executive Apartments’ 2 Bedroom Deluxe Suite spreads across a generous 100sq. meters. Glass-walled and dripping in comfort, the suite features an impressive marble bathroom and bathtub, pillowtop King and Twin bedding, lavish robes and slippers, air-conditioning and a separate living area for privacy. You’ll never want to leave your suite with access to a fully-equipped kitchen, spacious dining area, minibar, tea and coffee making facilities, high-speed Wi-Fi and 3 flat-screen TVs! 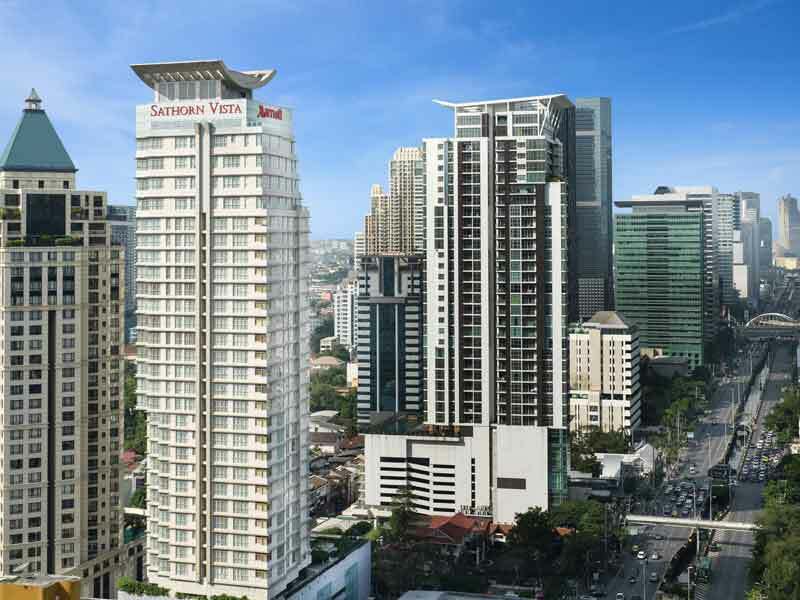 Set in the heart of bustling Bangkok, Sathorn Vista, Bangkok – Marriott Executive Apartments is located near infinite local attractions – Grand Palace, Chatuchak Weekend Market, Erawan Shrine, Lumpini Park and Temple of the Dawn just to name a few. The hotel is convenient 30-minute drive from the Don Mueang International Airport and the Suvarnabhumi Bangkok International Airport (an estimated taxi fare of 500 THB – one way). Around the hotel, there are activities for all travellers to enjoy. 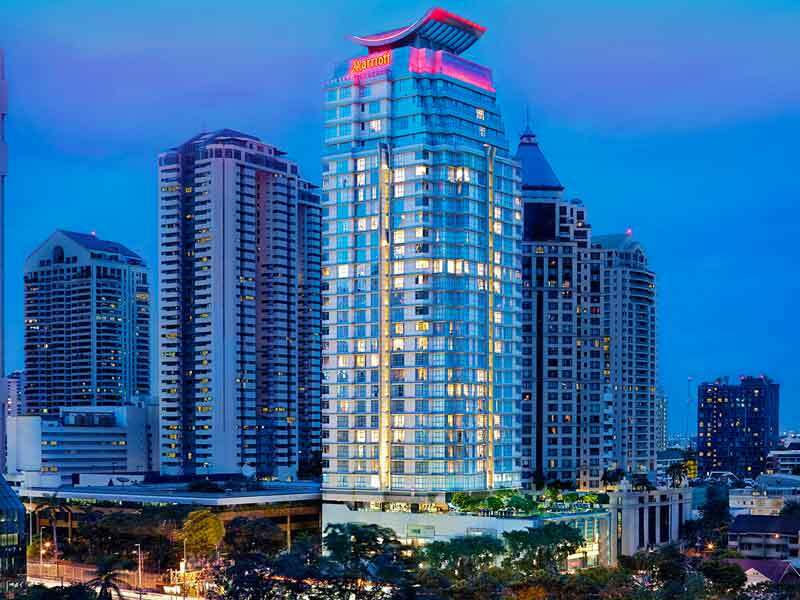 For the more active guests, Sathorn Vista, Bangkok – Marriott Executive Apartments features an epic fitness center, an outdoor saltwater pool and whirlpool! 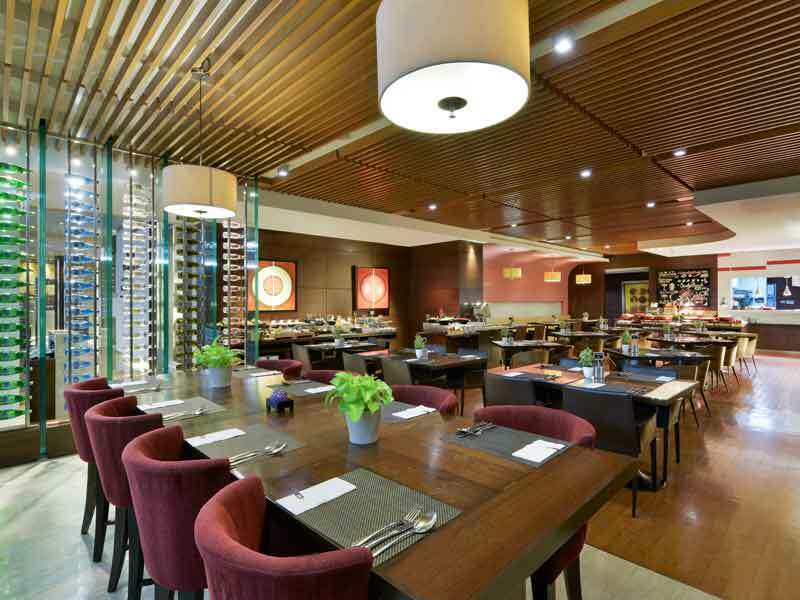 To unwind, sip a cocktail at the pool bar before dining at Momo Café for exquisite Asian and International cuisine with a modern twist. Just outside the hotel, you’ll be able to up your bargaining game at the vibrant Jatujak Markets, float along Chaopraya River on your private night cruise, stroll through beautiful Lumphini Park or become further immersed in Thai culture at Erawan Shrine, Wat Arun (Temple of the Dawn) and Wat Po (Temple of the Reclining Buddha). Other nearby activities include golf, volley ball, rock climbing and table tennis. Whatever your interests, Bangkok will not disappoint! We absolutely loved our stay at Sathorn Vista, Bangkok – Marriott Executive Apartments. Our kitchen was fully-equipped and we had everything we could possibly need – we even had a washing machine and dryer! The location is extremely central, near all the shops and restaurants. Public transport is also within walking distance. The staff are super friendly and always willing to help. Breakfast was great with lots of choices. We had a truly comfortable, relaxing stay and hope to return when we’re in Bangkok again!